The parking lot owner (who also owns the temple) doesn't care for it, so he hacked it off once when it popped up last year. 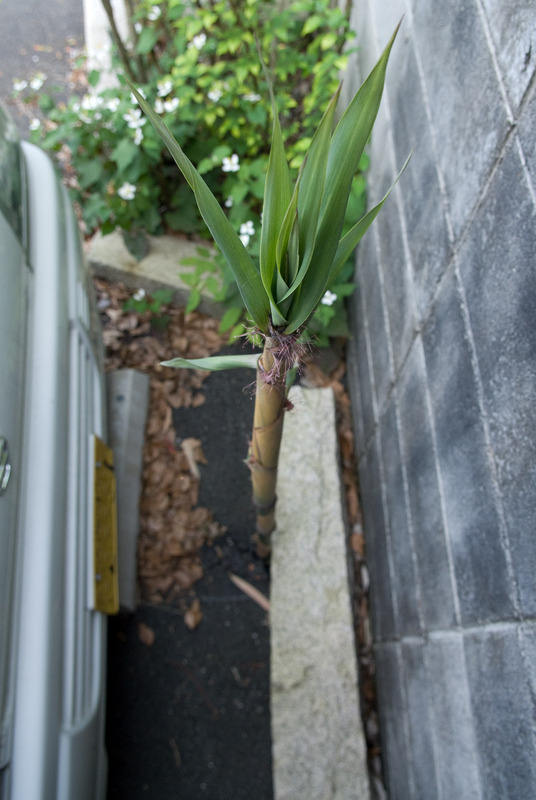 You can see its remains to the left of the growing shoot above. I've been watching this one for the last couple of weeks, hoping that it doesn't get cut down. It grew about 15 feet in 16 days, which averages more than 11 inches a day. That's far less than the maximum of 2 inches per hour claimed on Wikipedia, but impressive nevertheless. 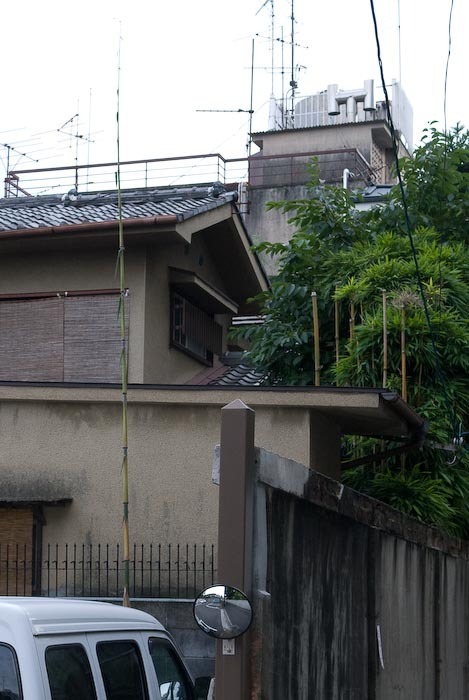 The one shoot above looks pathetic all by itself, especially with such an unphotogenic backdrop, but generally speaking, I love the look of bamboo, both when it's growing (e.g. like this or this), and the many ways its used after it's harvested, such as in fencing, security, flooring, wall construction, wall covering, of course, in the arts (such as ikebana and lanterns), and, well, just about everything. I wonder if it can be used as a source of biofuel as well? That growth rate really is remarkable. 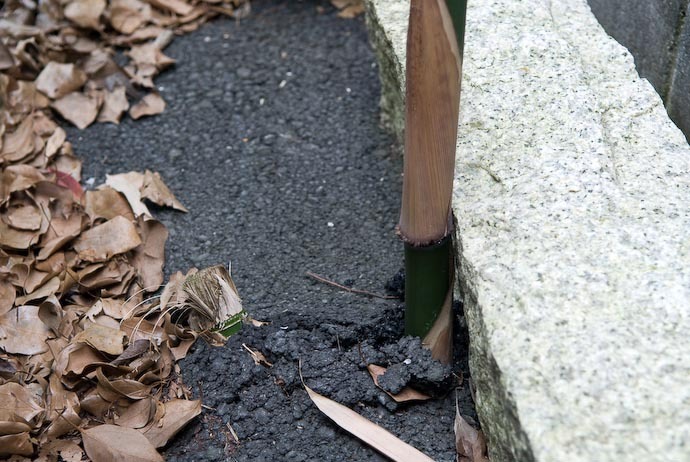 When I first noticed that bamboo shoot I wondered where the energy came from for it force its way through the asphalt (it was very small at that point). I reasoned that it certainly wasn’t getting energy from the sun as its leaves were tiny. But, I now think that maybe it is connected through a root system to larger shoots elsewhere, which do derive energy from the sun, and it gets its power from there. That said, it still demonstrates the power of life and its will to live. What people don’t realize is that bamboo is a grass, not a tree. It’s hollow, with many shoots connected via underground networks of roots, and with “grain” that rises vertically instead of horizontally as in trees.